The free ride is over, ladies. 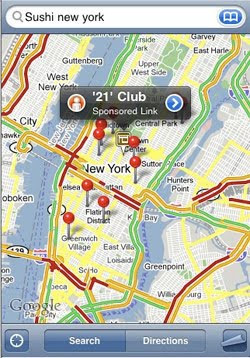 Go ahead and fire up the Google Maps Apps for your iPhone (or iPhone touch), and you may well run into something you’ve avoided for so, so long: an ad. That’s right: Google Maps now shows advertisements. Things fall apart. As you know, I don’t have an iPhone, nor will I ever, but here you can see what happens when you search for “sushi” in the City of New York. The ad itself, as Search Engine Land agrees, is rather unobtrusive; it’s not like one of those dumb Hulu ads that prevent you from using the site while it airs. SEL also throws in some speculation that I’ve never seen before, that Apple is working on its own Map App, one that, presumably, wouldn’t bombard you with ads. The 21 Club is a fancy restaurant on West 52nd Street. Like, we’re talking suit and tie fancy.